For Xmas, Jasper got a Plan Toys "Eco Town" (along with their parking garage and cars and such.) We had it on the floor for him, but he was constantly walking over it, causing the play mat to fold up on itself, the town to fall apart, and so on. We wanted to get a table for him to play with it on instead of it being on the floor. 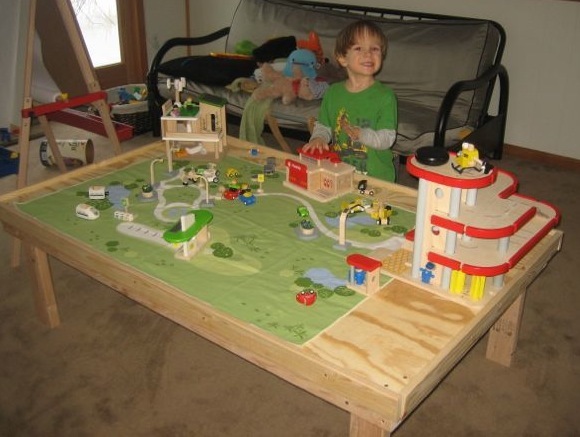 Looking around, we found that the Plan Toys table was about $150 and didn't really have enough room for the parking garage, and such. I knew I could make one less expensive, although not as "pretty". The design is based on just simple 2x4 construction, held together with drywall screws (aka the duct tape of screws.) I wanted to make it larger than the Eco Town, which was roughly 4' by 2'6". I measured what the town + parking garage would take up, which was approximately 3' by 5'. I was in a toy store recently and vaguely measured the height of a toy train table at the bottom of my knee, which is about 18" up from the floor. Here's the basic sketch I made late on Friday night. 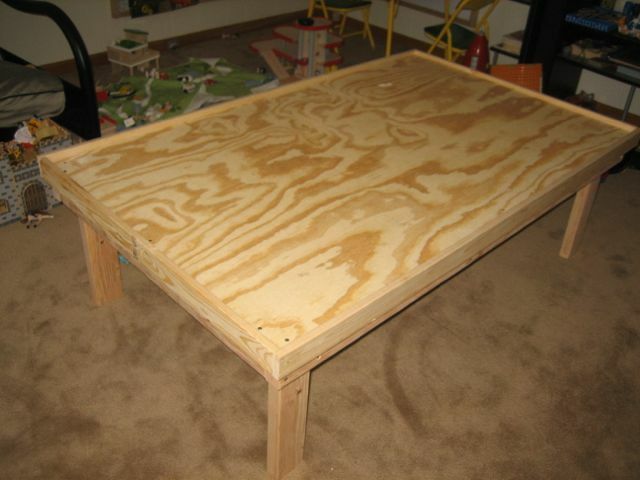 It shows a basic 2x4 frame that is 3' deep by 5' wide, with four 18" tall legs. I decided not to put in any additional cross bracing as it is so short that they wouldn't really do much. If i were wrong, i could always add them later. Also, the way this is constructed, I can easily replace the legs with longer ones later, making it a standard table/work surface height. One of the things that we wanted was to have a lip around the outer edge, so that cars wouldn't roll off to the floor. Total cost of materials was $54. Quite a bit less than they sell the single-purpose table I could buy. First, I attached the 5' 2x4s to the 2'9" 2x4s, using the plywood top to help line them up, since I'm an idiot and don't own a framing square. 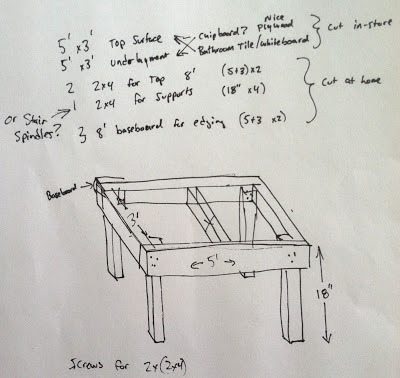 Each one was connected at the corners using two 2 1/2" drywall screws, with the wood pre-drilled with a countersink so that none of the wood splits. 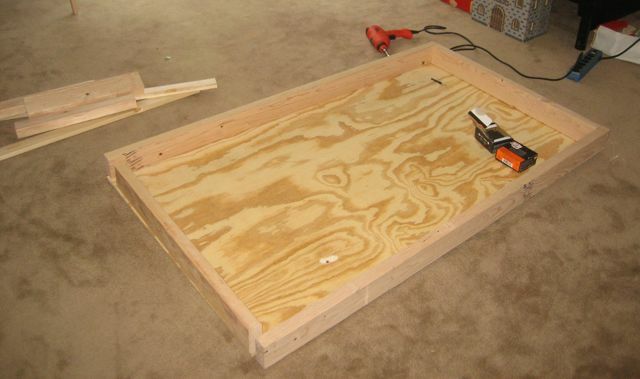 Once the top frame was completed, I put the plywood on top of it and starting in one corner, countersink-drilled holes and used the 1 5/8" screws to hold it on. Once I finished one corner, I lined up the frame with the top for the next corner, and worked my way around it to get the frame to line up, square, with the plywood. 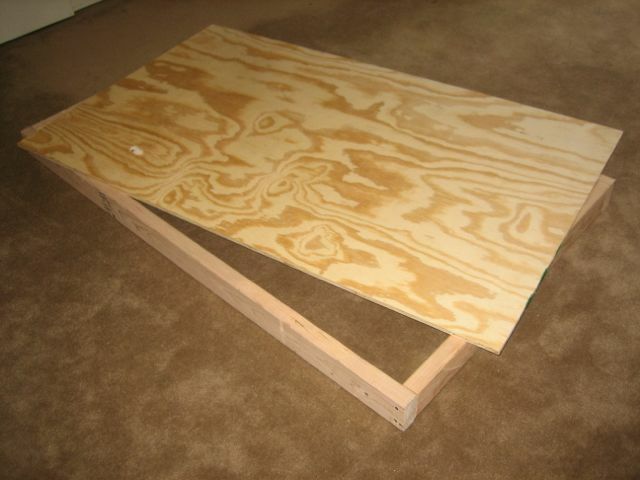 Next, with the table upside-down ("top" of the table on the floor), I drilled and screwed in the 18" long 2x4s in each corner, to act as legs. 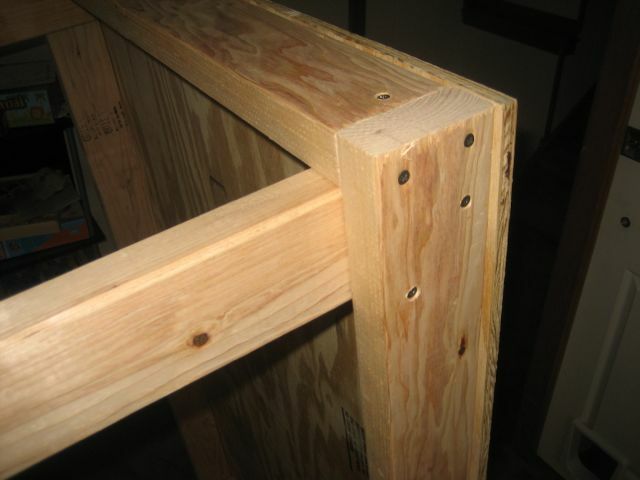 I kept the top of the 2x4 against the plywood, and attached two screws into the 5' long front rail, and one screw through the 2' 9" long side rail. 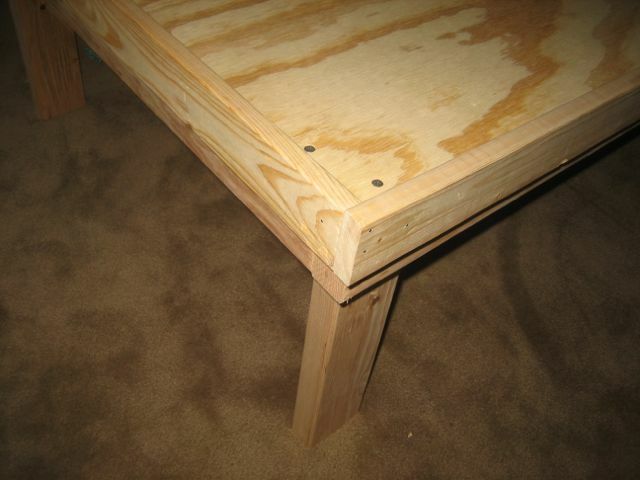 This serves to hold the leg without it wobbling, and to additionally hold the frame together. In the future, It's 3 screws to remove the legs, to replace them with longer legs. Next, I added the 1x3 side rail lip. I started by lining up the 3' sides. I used a piece of scrap 1x3 to get the proper height. It sticks up 3/4" above the table top. After I got the 3' side on, I moved to the 5' 1 1/2" length and got that attached, lining it up with the first side... all the way around. Once I nailed this on, It was basically complete! A few more nails in the future, or perhaps using screws to hold on the lip might be necessary. Just a detail showing the corner construction. Jasper seems to like it a lot, and I think it will last for many years to come. I may need to build a rolly-box to slide underneath it to store toys, but that's a project for another day.